Competition is driving the cost of entry for 3D printing down, and that's great news for those looking to try out this new technology. Our top pick for those on a tight budget is the da Vinci from XYZ printing. Priced under $500, the da Vinci is a full-featured printer that offers a large build volume (7.8 by 7.8 by 7.8 inches, for a total of 474 cubic inches) and an enclosed printing area that keeps curious fingers away from the hot plastic. The device prints in ABS plastic with a minimum layer height of 0.1mm, and comes with its own XYZWare software that can print most types of 3D models from both Mac OS and Windows computers. It isn't the cheapest 3D printer available (that would be the $350 PrintrBot Simple 2014 kit), but the XYZ is the cheapest ready-to-print model out there. And with what looks to be very solid performance, this should make a great pick for the budget buyer. The UP Plus 2 offers excellent support options, included accessories, and PLA and ABS printing. Although it will only print small objects, this 3D printer is well designed for solid, quality prints. Print quality might be competitive for the UP Plus 2 printer, but speed is really lacking. Speeds can only reach 3-30 mm per second, so you'll be on hold for hours waiting for your 3D models to print. Size is also another disappointment, as you can only print objects under 5.3 x 5.5 x 5.5 inches in dimension. Both ABS and PLA are supported by the UP Plus 2 printer. Filament from the manufacturer is recommended, but costs upwards of $55. As an alternative, you can use any generic or universal 1.75 mm cartridge from another retailer; just be aware it isn't specially designed for the UP Plus 2 printer like the manufacturer filament is. The UP Plus 2 may be a sensible option for your home 3D printer, as it is smaller in size and weighs considerably less (only 11 pounds) than many of its counterparts. The filament size is 1.75 mm and there is one print head available, which means it can print in only one color at a time. The best home 3D printers allow you to connect through USB, SD card, flash drive and Wi-Fi. We are sorely disappointed with the lack of connectivity that the UP Plus 2 3D printer provides. You are only able to connect to the desktop 3D printer through a USB port. Linux operating systems are also not supported. If you want to really understand how 3D printers work, you can't beat the experience of building your own. The most interesting DIY 3D printer at the moment is the RepRap Mini Kossel. This 3D printer is a delta design, meaning three motorized arms move the print head in three dimensions, rather like a spider hanging from its web. Since the Mini Koessel is a completely open-source design, freely available plans document everything you need to know about how to build the device. You can buy the parts at a hardware store, or 3D print them from the provided files. You don't have to go that route, though: MakerGeeks sells a kit of the 3D-printed plastic parts for $70 and the electronics for $490. Add in a few easily available nuts, bolts and beams for the frame, and you have all you need to build your own 3D printer and learn a lot in the process — all for a total cost of less than $900. The latest generation of MakerBot's Replicator 3D printer takes the promise of plug-and-print to a new level by increasing the size, resolution and speed of prints. This model increases the maximum print size from older replicators to 9.9 x 7.8 x 5.9 inches, a total of 456 cubic inches, and ups the accuracy, with a minimum layer size of 0.1mm. MakerBot also claims that the 5th generation version prints 11 percent faster than the previous edition. A built-in webcam on this $2,899 3D printer allows you to monitor the build process from a PC or smartphone, and an enclosed build space means fewer printing smells and prints spoiled by drafts. MakerBot has focused on printing with PLA for this generation of its devices, and has also added a 3-inch LCD screen to make it easier to use the printer as a stand-alone device. The Replicator can also be controlled over USB and Ethernet connections, with a Wi-Fi option coming soon. So if you just want a printer that you can plug in and use without hassle, the 5th Gen Replicator is our pick. 3D printing can be complicated, so it's best to start out with a straightforward printer. Priced at "under $1,000" (all the manufacturer has said so far), the Cubify Cube 3 is one of the simplest printers available. The company puts the filament (either ABS or PLA) in a sealed cartridge that is available in 20 colors, and is easy to change. The system also provides software that outlines a step-by-step approach to printing. The package includes plenty of premade digital designs to customize and print. At $1,000 or less, the Cube 3 is competitively priced against similar (though less polished) printers like the Solidoodle 4th generation. The Cube is also safe for kids to use. Because there's no heated print bed, you won't have to worry about burned fingers. Plus, the prints are easy to remove from the print bed. The Cube connects to computers over Wi-Fi, making it simple to share designs among multiple PCs. The Cube's simplicity has its downsides. You have to buy Cubify's filament cartridges, which cost a little more than generic spools and come in only five colors. And Cubify's 90-day warranty is short for a printer designed to handle the rough and tumble of family or educational use. Overall, though, this printer's simple, user-friendly design and software make glitches much less likely. The printer is due soon, but hasn't yet gone on sale. If you want to push the boundaries of 3D printing, the Hyrel Hobbyist is the model for you. This new printer supports up to four extruders, so you can print multiple copies of objects at once, or print with multiple materials or colors in one object. And it goes beyond standard ABS and PLA plastic. The optional EMO25 extruder can handle materials like air-dried clay, silicone, Play-Doh or Sugru, which makes flexible objects. (However, these materials are experimental and not widely tested.) The company is also experimenting with other materials such as nylon. These extruders can also be quickly swapped out, so the E2 Hobbyist is somewhat future-proof. The E2 Hobbyist is reasonably priced for all those capabilities: $2,145, which includes one extruder. Each EMO25 extruder is an additional $200, or $250 for the pro model with five nozzles. An all-in-one version of the printer with a built-in PC (the E3) starts at $2,345. There are caveats: Hyrel is a new, unproven company, and models are available only on a pre-order basis, with a backlog of several weeks, But the E2 Hobbyist is by far the best option for those who want to experiment with printing materials beyond basic plastic. CES 2014 was the debutante’s ball for a lot of 3D printers, but the one that rose to the top was the RoboX, a new printer from CEL UK. Coming off a hot Kickstarter campaign, this 3D printer takes a new approach to using plastic filament to print: using two differently shaped nozzles. These are the business end of the printer, where the plastic gets squirted out to create the object. Existing FDM (Fused Deposit Manipulation) printers use one fixed nozzle, which partly determines the thickness of the printing layer. The RoboX uses two: a large one with a hole of 0.8mm diameter that deposits lots of plastic for thick layers (and quick printing), and a smaller 0.3mm diameter one that deposits less plastic, for thinner layers. Combine these and you get the best of both worlds: quick printing of parts like internal supports that aren’t visible, and more precise printing of the delicate details on the outside surface of the print. The company has also designed an interchangeable print head system, which, they claim, will allow them to add support for printing in other materials, or to subsequently add completely new features such as 3D scanning. Priced at $1,349 and available in the first quarter of this year, the RoboX looks like a promising printer that takes a different approach than most of the ones currently on offer. 3D Printers that use the STL (STereo Lithography) printing are typically expensive, because the technology is complicated. However, a new entrant to the 3D printer market is promising to bring down the cost. The Pegasus Touch printer from Full Spectrum Laser (who make laser cutters) is promising to being down the cost of these very accurate printers by offering an STL printer for around $2,249. The Pegasus printer uses the same technology as its more expensive siblings, building objects from a polymer resin using a blue light laser that solidifies the resin, building the object layer by layer. The Pegasus Touch has an impressive set of features, including a 7 by 7 by 9-inch build volume and a built-in Linux computer that controls the printing process and makes it a stand-alone device. This means it can print directly from a 3D model without requiring a separate computer to create the printing path. As the name implies, it also includes a touch screen that allows you to control the printer directly, as well as Gigabit Ethernet. The company will be selling the resin used to print models in a variety of colors and textures, at a cost of $100 per kilogram. The Pegasus Touch will be shipping in July, although April shipping is available for those who pay more. After the Kickstarter campaign completes, the Pegasus Touch will be available for a price of $3,349. Small businesses and serious hobbyists who use a 3D printer on a daily basis need a model that is reliable and offers very good tech support if it breaks. Stratasys Mojo is the best pick for its excellent support, which includes onsite service and easy supply ordering. That all comes at a price, though: a hefty $9,995. The Mojo prints using ABSPlus thermoplastic, which Stratasys claims is stronger and lighter than normal ABS, so it is suited for making complex and larger objects. The Mojo can also simultaneously print with a water-soluble support material called SR-30, which provides support for complex objects during printing. When the print is complete, the support material can be quickly dissolved with water. The Mojo includes a washer that does this automatically, so you don't even need to get your hands wet. 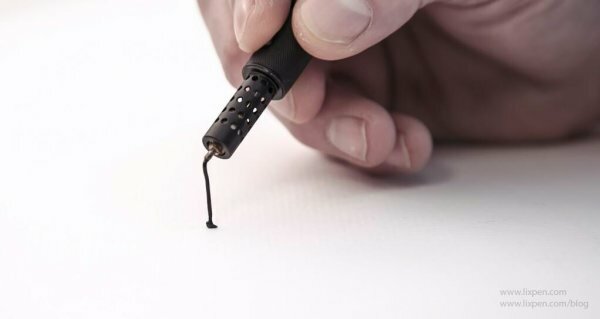 The Lixpen claims to be the world’s smallest pen and will be launching a Kickstarter campaign very soon, the sleek design looks more akin to a stylish ball point pen that a 3D printing device but it melts and cools plastic to create free standing structures just as you’d expect. Available in two colours; black matte and white matte; the pen will have a launch price of $139.95 USD (£85) and according to a post on Dribble is created by Anton Suvorov. Other 3D pens have fallen by the wayside as 3Doodler have either crushed them with excellent marketing or excellent lawyers, it will be interesting to see what happens to Lixpen.